Please look at the image below while reading the following description. There are two (or more) cameras that are connected to an input selector. An input selector is a device that has multiple video inputs, one video output and buttons to select which input is passed through to the output. The device is normally used to connect multiple devices to a television set (DVD, satellite, Playstation etc.) A consumer video input selector costs about 25-50 €. A video mixer can be used instead of a video input selector if the budget is not limited. Finnish Curling Channel uses two shotgun condenser microphones to catch field audio (M1 & M2 in the overview image below). In addition to these there are two normal microphones for commentators (M3 & M4). All four microphones are connected to a 4-channel audio mixer. 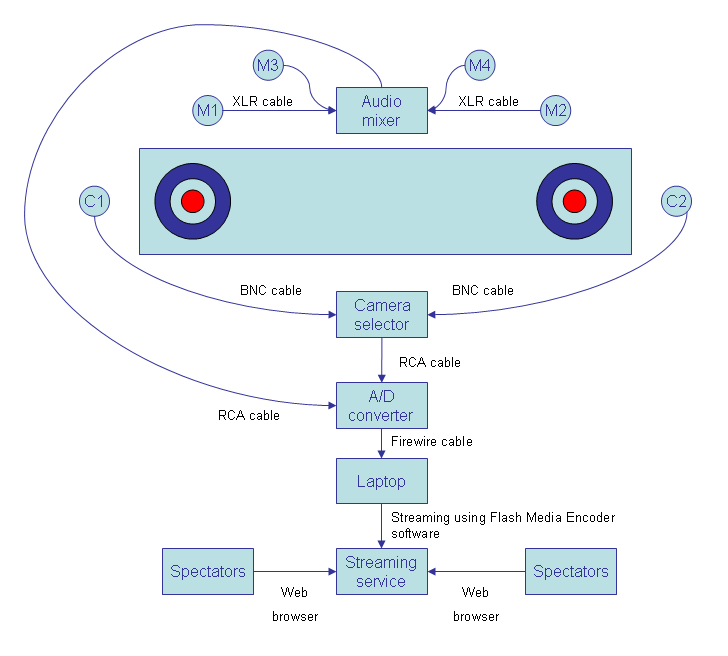 Video output (from the video input selector device) and audio output (from the audio mixer) are connected to an analogue-to-digital converter that has a firewire output to connect the converter to a laptop. The price of a converter is about 150 €. Finnish Curling Channel uses Canopus ADVC55 converter. The AD-converter is connected to a normal laptop computer with the firewire connector. If the laptop doesn't have a firewire port, a PCMCIA adapter can be used. The price of the adapter is about 20 €. The software needed for streaming depends on the streaming service provider. At the simplest no special software is needed and the streaming is done with a web browser using flash. Another possibility is to use special streaming software that will send the stream to the servers of the streaming service provider. Finnish Curling Channel broadcasts using Livestream.com. Other service providers include ustream.tv. The spectators will watch the stream from the servers of streaming service provider. This way the video is uploaded only once from the curling hall and the servers of the streaming service provider will take the load of serving the video to the public. Some streaming providers support embedding the player to your own website. You don't need professional or even HD-cameras. The picture will anyway be compressed quite heavily so the picture won't be HD quality anyway. Manual exposure setting: The ice will reflect a lot of light and the automatic exposure programs are easily fooled by this. You'll want to add exposure manually to lighten the picture. Manual white balance setting: The lightning conditions in the hall can be challenging. If you want white ice to look like white ice (and not green or red), you'll need a manual white balance setting. All cameras have an yellow video output. Use a RCA-to-BNC adapter to connect the camera to a long video cable with BNC connectors. Use another BNC-to-RCA adapter to connect the cable to the video input selector. Audio is more important than you might think of. Try to watch any sport event with no sounds and you realize how much you miss the sounds. Good microphones cost money and the audio mixers get more expensive if you need more channels (microphones). Finnish Curling Channel does not have wireless microphones for players but we do have two highly directional condenser microphones that we can use to get the field audio and to hear the skips. Finnish Curling Channel uses inexpensive T-Bone EM9600 microphones from Thomann.de (about 50 € each). Finnish Curling Channel uses a 4-chanel audio mixer. This kind of a mixer costs about 70-200 €. If you use condenser microphones, make sure that your audio mixer has phantom power. Otherwise the condenser microphones need batteries which is not practical. You'll want to have at least two channels for the commentator microphones. Your broadcast will be so much more interesting when you have two commentators discussing about the game. They both need their own microphones. Microphones are connected to the mixer with XLR cables. Finnish Curling Channel uses free Livestream.com as the streaming service provider. We use free Adobe Flash Media Encoder to send the video to the Flash Media Servers of Livestream.com. There is also a web interface called Livestream Studio that can be used. Finnish Curling Channel started without camera cranes. During the first season of the Curling Channel we used Manfortto Superclamps with ball heads that can be used to mount the cameras virtually anywhere. Today we have two camera cranes that are placed behind the houses of the curling sheet (see C1 and C2 in the image below). One possible crane would be Hague K10 crane. The equipment of Finnish Curling Channel does not support remote control of the cameras (remote zooming etc). If you have ideas how this could be easily (and hopefully inexpensively) achieved please write a comment below!